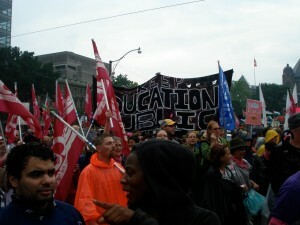 These images were captured on 26 June 2010 at the G8 & G20 public rally and march. 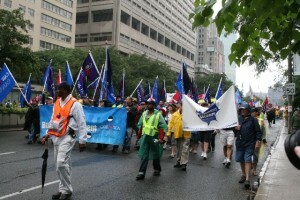 My thanks are due to Ed Dwyer of the Retirees' Chapter of CAW Local 222 and Ian Milligan for sharing photos with me. Throughout the 1960s and 1970s, a group of historians sought to rescue terms like “crowd,” “mob” and “riot” from the “condescension of posterity,” illustrating that crowd actions of the past were often more than the thoughtless acts of thugs and criminals. The late British historian E.P. Thompson has undoubtedly made the greatest contribution here. His 1971 “The Moral Economy of the English Crowd in the Eighteenth Century” explores food riots in eighteenth-century England, suggesting there was indeed a well-thought purpose inspiring rioting English crowds. Agitating against the free market ideology propagated in Adam Smith’s 1776 Wealth of Nations, rioting crowds sought to protect their “moral economy,” rooted in a tradition of paternalism, protection of the poor, and a just price, from the turn to a profit-driven economic system underway in England at the time. Some readers may wonder what eighteenth-century food riots have to do with twenty-first-century Toro nto and the G20? Very much, I would suggest. 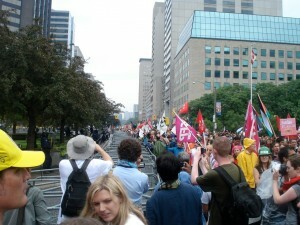 Having attended the public rally and march that took place before the G20 Summit on 26 June 2010 in Toronto, I had great difficulty reconciling the media coverage of this event with what I witnessed from my position in the crowd. The mainstream media largely focused on the ‘violence’ of the day, often through images of attacks against corporate and police symbols perpetrated by a very small few of the thousands who turned out. Terms like “mob,” “riot,” and “thugs” were deployed frequently, often associated with protesters, brimming with negative connotations linked to vandalism and violence. One activist, speaking with Steven D’Souza of the CBC, nonetheless tried. 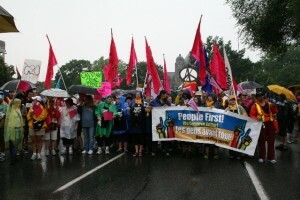 While allowing that the crowd gathered expressed a number of diverse messages, he suggested that they were perhaps united in their belief that the G8 and G20 are undemocratic or illegitimate organizations, that decisions affecting the world ought to be made in a global forum, where more than the wealthiest few nations are welcome to participate – democracy, after all, should be about more than allowing voice from the richest few. This forum already exists in the United Nations, or what some have termed the G192. The UN is often limited by budgetary constrictions, but as some critics point out, estimates of the security costs alone incurred by hosting the G8 and G20 for a few days in Ontario are less than half of the entire UN’s annual budget. Despite this, the oft-posed question by many in the media was not whether these meetings should take place, but rather whether they should take place outside of urban centres, with ‘world leaders’ isolated from citizens. Images of smashed windows and burning cars no doubt feed fears of the need for protection from “thugs” who perpetrate violence. And violence has certainly been a prevalent theme in the coverage of this G20 Summit, whether it was used to describe acts against property or people – yet surely it is important to distinguish between violence against people versus acts of vandalism. Leading up to the G20 protests, I was told many times that I was crazy to go, that there would be riots, that the army would be there, and people were going to be hurt or killed. Hadn’t I heard how many cops would be on site, and the weapons they might deploy against the crowd? Police were certainly showcasing a range of weapons for crowd control leading up to the Summits, and telling people to stay away. 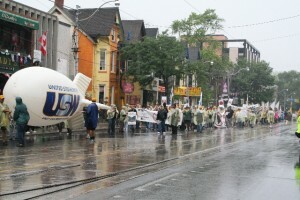 But idealist that I am, I believed that I could trust in this crowd of protesters. I believed that, like Thompson’s English crowds of the eighteenth century, they would not commit thoughtless acts of violence against their fellow people in a worthy tradition of popular protest. And as it turned out, there were no serious injuries, although accusations of police brutality have certainly abounded in the aftermath of protests. But my purpose here is not to focus on the violence of this event – there has been enough of that. Instead, I’d like to share the main images I’ll take away from my G20 experience, those of thousands upon thousands of people gathered in peaceful protest, walking side-by-side in an incredible display of unity, harmony and festivity, calling for a fairer world. And police pointing weapons at me, as early as when the peaceful protest passed the American consulate within minutes of leaving Queen’s Park. But these weren’t the dominant images beamed across the world; only a few lines of many featured stories of the day were devoted to the large peaceful protest, setting up the ‘main’ story of riots, vandalism and violence. Those who advocate more drastic measures say that peaceful protest doesn’t work, that something more sensational or extreme is required to carry a message – “propaganda of the deed,” so to speak. Events as they were covered in the media during and after the G20 protests certainly seem to confirm that peaceful protest doesn’t work in this respect. Meanwhile, the overwhelming focus on images of vandalism reinforce the collapsing of terms like “thug,” “riot,” and “protester,” associated with senseless acts on the part of a mindless “mob,” even though these images represent the actions of a very small minority. The real “mob,” the great crowd of protesters, was indeed moved by thoughtful purposes – apparently just not those sensational enough to make headlines. E.P. Thompson’s attempt to free the term “riot” from its negative connotations, to illustrate some of the positive aspects and purposes of popular protest, not only held resonance in eighteenth-century England; Thompson was also speaking to the political currents of twentieth-century England, believing that knowledge of the past could effect positive change in the present. It seems we still have much to learn from him in twenty-first-century Canada. 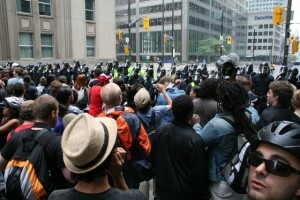 Stay tuned for the next instalment in this series, where Ian Milligan will explore Toronto’s police presence. E.P. Thompson, The Making of the English Working Class. I’m happy to have found this blog, and to read this thoughtful article. Another book worth examining is George Rudé’s “The Crowd in History” which covers different episodes in France and England between 1730 to 1848. There is definitely the need to distinguish between this “riot” – which was a planned action by a miniscule portion of a quite large and vibrant peaceful demonstration – and something like the French and Greek riots in recent years in which pent-up anger among wide layers of young, unemployed, often racialized groups manifest themselves in sustained and, if we’re honest, truly spectacular levels of property destruction. While infamous for its lynchings of African Americans, the New York City draft riots during the Civil War were also manifestations of broader social grievances among the poor and working classes. Iver Bernstein’s book does a pretty impressive job at contextualizing the riots and lynchings, which actually emerged out of a more respectable labour-led work stoppage around economic and political issues. 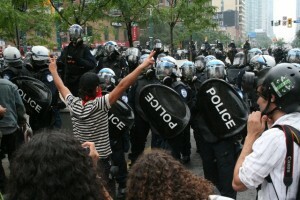 If Bernstein’s interpretation is valid, then in many respects the lynchings and widespread acts of arson served the same negative role in discrediting legitimate demands from wider social forces, much like the small number of vandals in Toronto allowed the mainstream media to ignore the broader and much more complex opposition to the G20. It also reminds me of the anarchists in the Haymarket derailing the mass movement for the 8 hour day. This deserves a really wide reading, Christine! Post it widely, people. Thanks very much for taking the time to read this and adding so much useful information. Your blog and research look very interesting. There have certainly been incidents of violent protest throughout the course of history, but so too have their been many, many incidences of peaceful protest. I’m not sure that lynching and vandalism are a fair analogy, but I very much appreciate the great examples you’ve provided. Thanks for contributing; hopefully we’ll benefit from your insights again in the near future. G20 G8 G192 – is the ‘G’ pure coincidence? Does the ‘G’ in G20 have a symbolic meaning? Is the ‘G’ in G20, G8 and G192 (the UN) pure coincidence or much more? The ‘G’ is supposed to stand for group, as in Group of Eight or Group of Twenty. Thanks for taking the time to read this and comment.